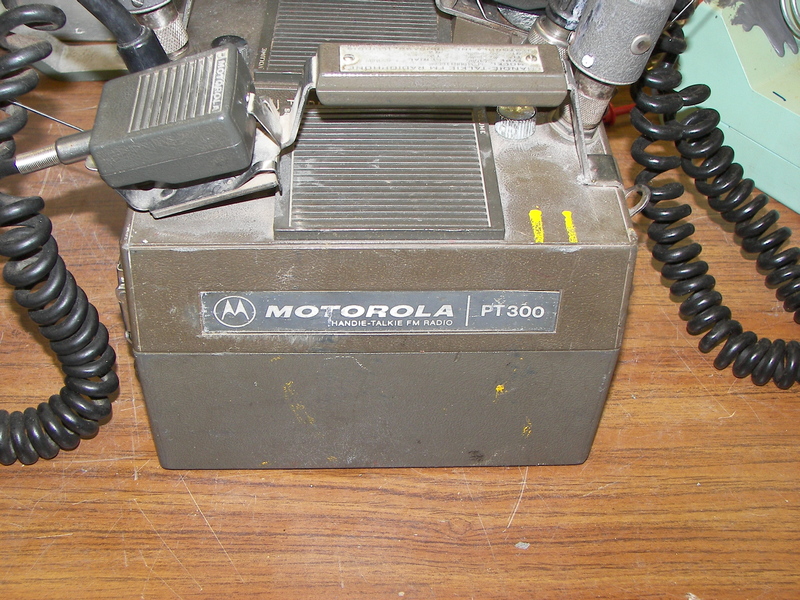 These Motorola PT300's belong to my friend Jack. He'd picked them up at a swap meet for $5 in 1997 and only one seemed to work, so they sat around just looking cool, occupying an honored place on a shelf. 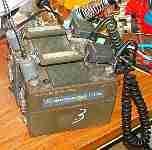 The power supply for these radios is derived from 11 "D" cells in series for 16.5 volts. The 3" speaker seems to be a 45 ohm unit and the audio output seems to be about 500-600mW RMS with minimal distortion. With the radio's large body cavity, this arrangement produces a surprising amount of sound. 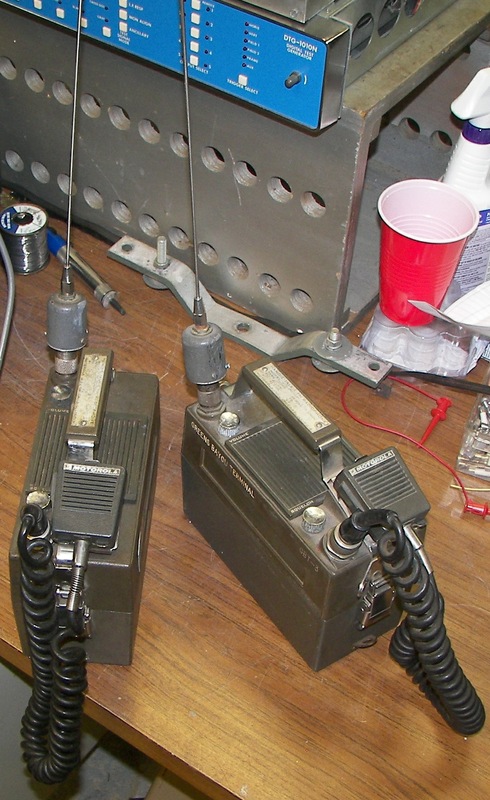 The radios are crystal controlled single channel units. 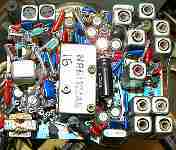 The RF power output appears to be 7.5-8 Watts into 50 Ohms. In order to use the radios legally, they would have to be put on the 6-meter ham radio band. 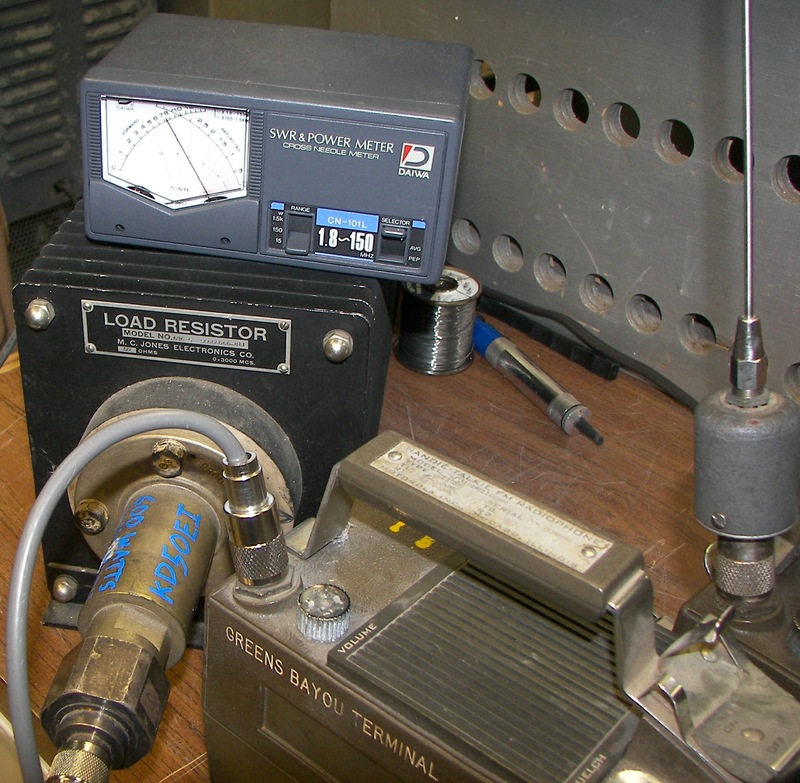 Test equipment used was a Tektronix 150MHz CRT-based digitizing scope, a 50 Ohm dummy load, an RF power meter calibrated from 2 to 150 MHz, and an Icom IC-706. The work was done in a fairly RF-tight laboratory (the Bunker of DOOM) to avoid causing or receiving interference. The repairs were done as follows: On a wild hare, We decided to try to repair these 33 year old relics. One had no audio output, so we tackled that one first. 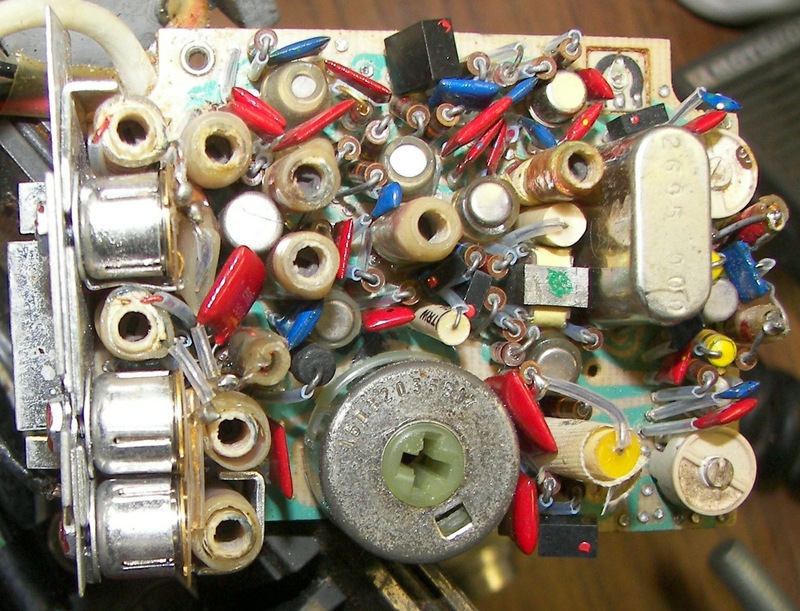 The output stage was a pair of complimentary germanium transistors. Both were bad. 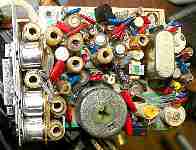 These were replaced with a complimentary pair of 40V 600mA 625mW silicon transistors (2N4403 PNP and 2N4401 NPN) with no il l effects. With audio now blasting out of the unit, it was obvious the other one, much quieter, must have had a blown audio output stage as well. 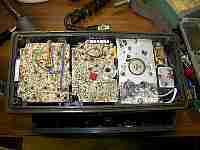 The second unit was given a new set of audio output transistors. The squelch would not mute. Several corroded solder joints were repaired. As of now the first one is in fine working order, but the second one has so little RF output that the meter cannot indicate it. I'll work on that some more. A very kind person was good enough to e-mail me a copy of Motorola document 68P81032A45--C, the complete manual. I am really grateful for that. I hope to get back to work on these and finish them up soon. For now, here are some pictures of these wonderful old radios, the likes of which many people have never seen. The top part is the transciever. 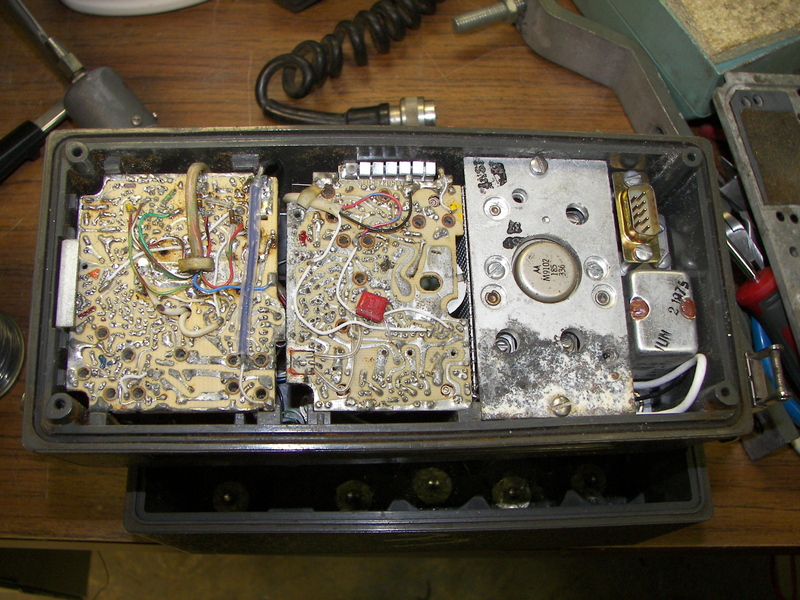 The lower part is the battery box with a 3A fuse and 11 "D" cells. 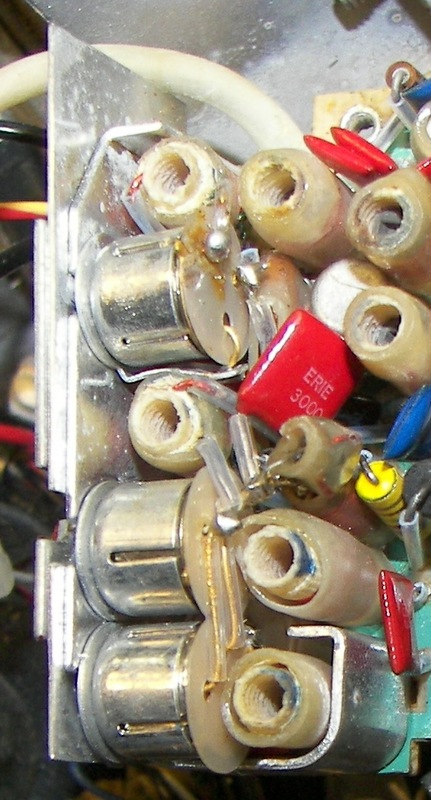 The power connector is a DB-9. 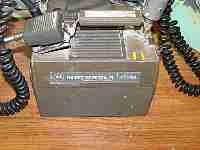 When the microphone is clipped into its holder, the radio is automatically switched off. The top section includes several small assemblies. 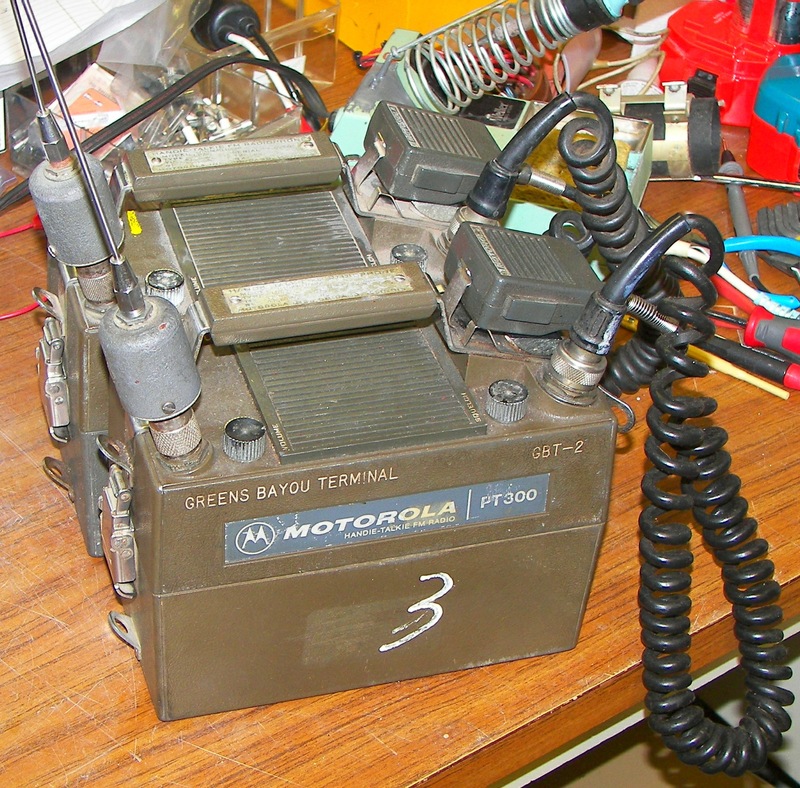 The three largest, from left to right, are the RF power amplifier, Transmitter, and Reciever. 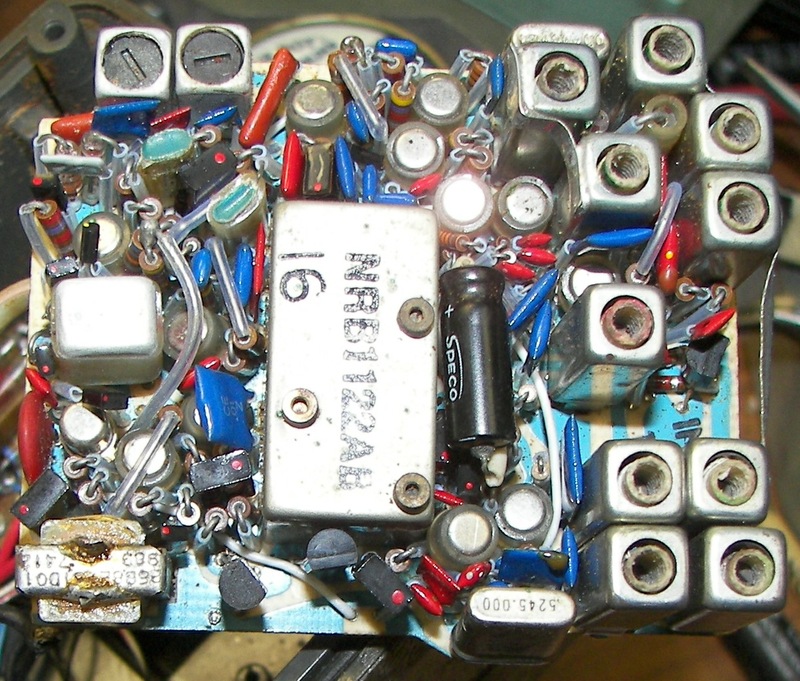 The smaller silver box is the T/R relay. Note the O-ring in the frame, and the large size speaker. Every part here is of the highest quality of the day. 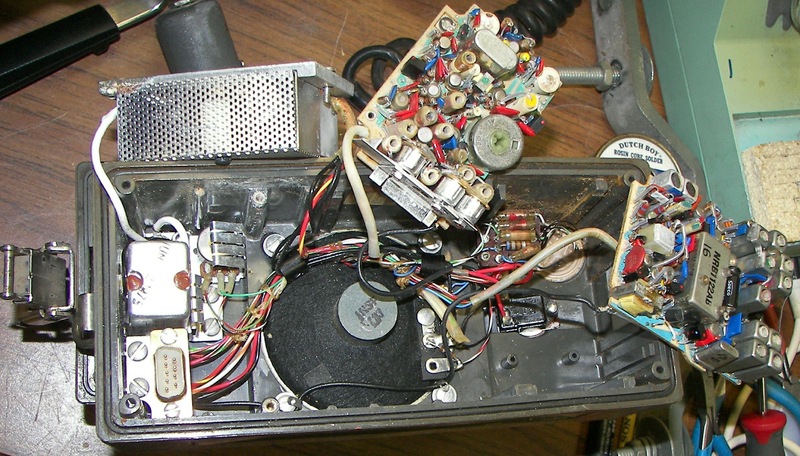 Note the metal-can transistors in their cylindrical heatsinks. The antennas clip back to the shoulder strap brackets when the units are being moved. 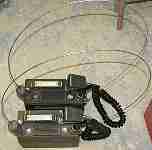 They can be use like this, but for best results the antennas must be free.